Upon arrival at Srinagar you will be received by our representative at the airport. Transfer to the houseboat. Overnight stay in houseboat. 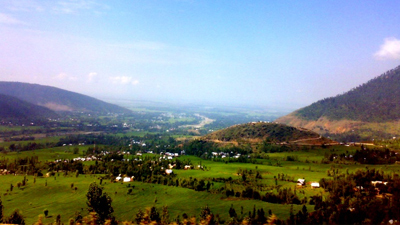 Today we will leave early from Srinagar by car and drive along scenic Jhelum River and villages of Bandipora. On arrival at Arin pack your load on mules. The trekking starts from here. You will come across the trails with steep ascend and lined with pine trees. Reach Kundara. Overnight stay in tents. Start trekking in the morning. Today's route will take you through the meadows of Poshpatri where a dance coating of wild flowers will greet you. Reach Sarbal Lake. Overnight stay in tents. Day 04: Sarbal - Kundsar Lake 15 Kms. Today we will leave early morning and starts ascending a mountain pass (above 4000 mtrs). Further descend towards Kundsar lake. Overnight stay. Day 05: Kundsar - Gangabal lake 16 Kms. 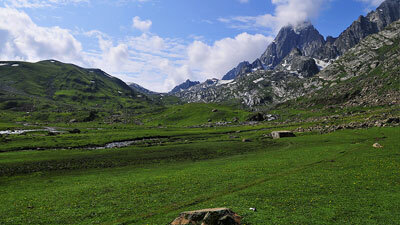 Leave early to reach Gangabal Lake passing through the meadows with steep ascend. Have a glimpse of the twin lakes of Gangabal and Nundkol. Walk down slowly. Overnight stay at Gangabal Lake. Today we will leave Gangabal and trek past the meadows of Bodpathri and Trunkol. Descend through a dense forest to reach Naranag. In Narang we board the car and within 2 hours we will reach Srinagar. Overnight stay in houseboat. You will be accompanied by our representative till Srinagar airport. In case you have time we can take you for seeing around Srinagar.